This set of Genetic Engineering Questions and Answers for Campus interviews focuses on “Synthesis of Proteins and Translation In Vitro”. 1. Little quantities of radiolabelled proteins are required for which of the following? Explanation: Protein synthesis is very important and they are having varied functions. Small quantities of radiolabelled proteins are required for co or post translational targeting and modification of proteins. 2. __________ quantities of _______ protein are required for determination of properties in biochemical and biological assays. Explanation: At times, large and non-radiolabelled proteins are required for determination of properties in biochemical and biological assays. It is also required for carrying out the crystallization for structural studies. 3. Small quantities of radiolabelled RNA can be produced by translation in vitro which is done by transcription in vitro. Is the given statement true or false? Explanation: If small quantities of radiolabelled RNA are required, it can be produced by translation in vitro which is accomplished by transcription in vitro. 4. For production of unlabelled and huge amount of proteins, which of the following is true? Explanation: For having, large and unlabelled proteins, transcription and translation both should be carried out in vivo. 5. How many methods are there, which are used for protein synthesis in vitro? Explanation: There are basically three methods which are used for protein synthesis in vitro. They are based on a lysate of reticulocytes. Explanation: Reticulocytes are immature red blood cells which are obtained from rabbits. The lysate of this is used for transcription in vitro. 7. What is the use of adding micrococcal nuclease in the reticulocyte cells? Explanation: The micrococcal nuclease is added in the reticulocyte cells in order to degrade the mRNA. This mRNA produces high amount of background in translational products. 8. Treatment of reticulocyte cells is done with EGTA. It chelates the calcium ions which are required for functioning of micrococcal nuclease. Is the given statement true or false? Explanation: The treatment of reticulyocte cells is done with EGTA. It chelates the calcium ions and they are required for functioning of micrococcal nuclease. It is required for cleavage of mRNA. 9. In ________ transcription and translation is coupled. Explanation: In prokaryotes, transcription and translation are coupled. It means that as the transcription is initiated, translation also starts. 10. In which of the following systems, transcription and translation are carried out together? Explanation: S-30 extract is the one in which transcription and translation are carried out together. In wheat gram extract and reticulocyte lysate, they are carried out separately. 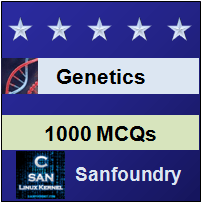 To practice all areas of Genetic Engineering for Campus Interviews, here is complete set of 1000+ Multiple Choice Questions and Answers.